Comedy in the Village: Oy Vey! 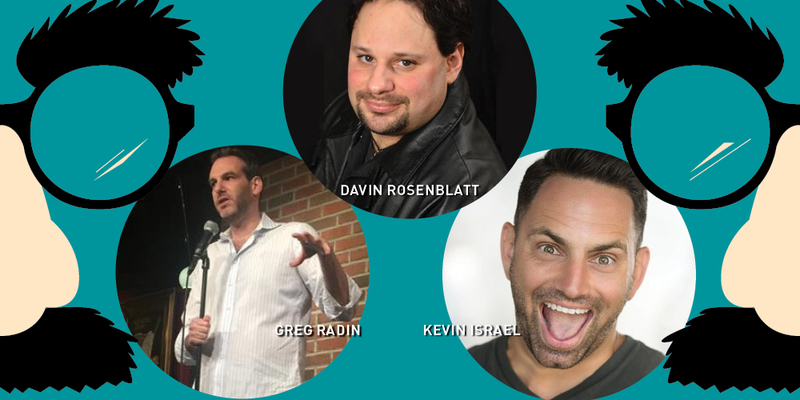 Three comedians– Greg Radin, Kevin Israel, and headliner Davin Rosenblatt–take the stage in Peddler’s Village to share their laugh-out-loud takes on life, relationships, and ethnic identities. Seats are limited, so reserve your seats now. For adults 18+. For more information, call 215-794-4000. When: Friday, April 26, 2019. Doors open at 7:00 p.m.; Show starts at 8:30 p.m. Recognized for his observational humor with a twist, Greg Radin is a staple at all the New York City comedy clubs. For more than 15 years, Kevin Israel has been entertaining audiences with an act forged at his family’s dining room table, in his fraternity house, and in the halls of law school. A former attorney and top political operative, he gave up his lucrative career to pursue his one true passion: comedy. Kevin has appeared on NBC, CBS, ABC, and FOX, and has guest hosted the Sirius Satellite Radio Raw Dog comedy morning show. Davin Rosenblatt lives by the belief that if you can’t laugh at yourself, stare harder in the mirror. His high-energy humor touches on a wide range of subjects, from life with a child to the current state of the country. He has performed at many New York comedy venues, universities, and prestigious festivals, and was featured in 2003 on Comedy Central’s “Fresh Faces of Comedy” as well as on various other TV and radio programs. He hosts his own weekly radio show. 22 available Comedy in the Village: 04/26/19 $30.00 Comedy in the Village held in Peddler’s Pub, featuring Greg Radin, Kevin Israel, and headliner Davin Rosenblatt. Doors open at 7:00 p.m.; show starts at 8:30 p.m. $10 food and drink minimum.